Beneath the dim glow of pale colored lights, five actors took to the black-paneled floor in the Scene Dock Theatre Sunday. Dressed conservatively in dark attire from head to toe, they nearly blended in with the theater’s unassuming backdrop — a curtain as black as the floor, pulled tightly across the length of the stage. The five actors sat in identical black chairs neatly placed against the curtain, black-bound books in hand. When the scene called for their respective character, each actor approached one of the five black music stands evenly spaced from stage left to stage right. There, they read, their eyes glancing from the pages of the book to one another to the audience, miming small actions yet never taking more than a step or two away from their music stands. 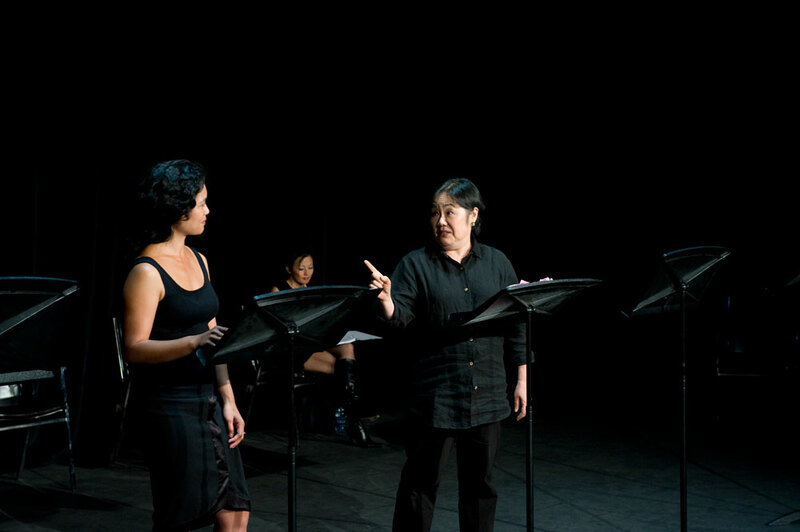 The color black is not a metaphor in esteemed playwright and USC School of Theatre professor Velina Hasu Houston’s newest work, Calligraphy: Fading Ink, Fading Memories, nor is the production’s simple decor the way Houston envisioned the play. Rather, the modest event that occurred in the tucked-away theater Sunday was a staged reading open to the public — just one of the many steps in transforming the characters and dialogue floating around in a playwright’s mind to a living, breathing stage production. It has been quite the process for Houston, Alfaro and director Jon Lawrence Rivera, who together have cut the play from more than two and a half hours to its current runtime of 90 minutes. This threading of intriguing characters — each possessing a boatload’s worth of emotional baggage and backstory — as well as humor and drama is the core of Calligraphy. The play depicts the fragile relationships between a Japanese family separated not only by the vast Pacific Ocean, but also by jealousy, discrimination and betrayal. Sisters Noriko (Emily Kuroda, most notable for her role as Mrs. Kim on Gilmore Girls) and Natsuko (Drama Desk-nominated actress Natsuko Ohama) have not spoken to one another since Noriko married a black U.S. Army soldier whom she met during World War II. Following the death of Noriko’s husband nearly 50 years later, both sisters are haunted by their unsettling pasts — yet they both refuse to find closure with one another. As Noriko and Natsuko constantly avoid confronting their histories, Houston intertwines the complicated lives of their two daughters, Hiromi (Tess Lina) and Sayuri (Tamlyn Tomita), who are attempting to not only reunite their mothers but also to cope with the inevitable — their mothers’ failing health. Houston also uses the two cousins — Hiromi and Sayuri — to represent how Japanese culture is conforming to the Western world and the difficulties resulting from this culture clash. 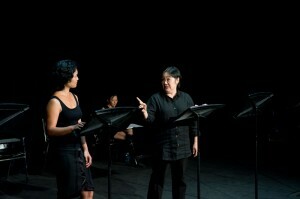 Though Houston admitted that she was jotting down notes throughout the performance on scenes and dialogue on which she could improve, the audience responded to the work-in-progress production warmly. Hearty laughs filled the intimate theater in nearly every scene, while heavy sighs and whimpers of concerned could be heard during the play’s more somber moments. The audience’s consistent sincerity could only mean one thing — that even in Calligraphy’s early stages, Houston has touched upon a human experience that truly resonates with a great number of people, no matter what race or age. In the first scene of Calligraphy, Noriko explains to her daughter “Japanese people love in a different way.” But stripped bare of costumes, props and lavish designs, Houston’s newest work proves that familial bonds are one of the most significant aspects of the human condition.